COTATI, CA, USA, February 5, 2019 /EINPresswire.com/ — Yuba Bikes is excited to introduce the Cargo Canopy to their robust line of cargo bike accessories, offering a new option for customers using the Supermarche or Electric Supermarche as an everyday mode of transportation. Yuba’s Cargo Canopy functions as a rain canopy over the front cargo space, to keep dry your most prized possessions. 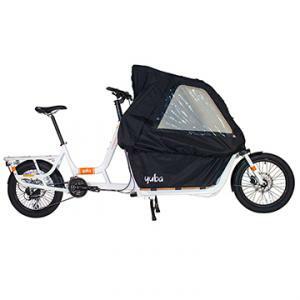 Yuba Cargo Bikes is proud to offer the largest selection of accessories for their fleet of stylish and comfortable kickass bikes, with options for every lifestyle and need, and the new Cargo Canopy means being able to offer complete coverage for any variable weather day. Complete with zippered front and rear windows for increased airflow or convenient windows, the Cargo Canopy features lightweight aluminum poles in the frame to ensure the accessory remains light, yet secure for easy travel, and collapsible for small storage when not in use. Yuba also added reflectivity to the front for easy visibility. 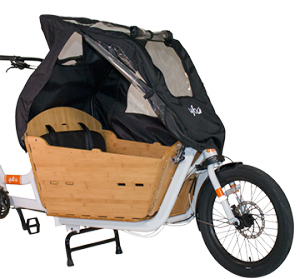 The Cargo Canopy is available for the Yuba Supermarche or Electric Supermarche; MSRP $299.